The interwoven, interdisciplinary culture of Caltech has inspired two significant gifts that are elevating and intensifying biological and medical engineering research across campus. Andrew and Peggy Cherng have endowed the medical engineering department in the Division of Engineering and Applied Science, and Tianqiao and Chrissy Chen have endowed the Chen Institute for Neuroscience, which finds its home in the Division of Biology and Biological Engineering. The prescience and generosity of these donors is matched only by the insight and creativity of Caltech’s faculty—and here we explore several connections and horizons that mark a new period of research at Caltech that brings together biologists, engineers, chemists, computer scientists, social scientists, and physicists in pursuit of revolutionary advances in health and human welfare. 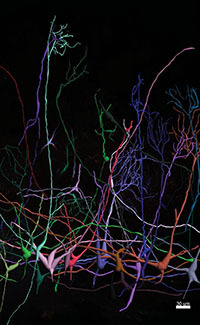 Involving faculty from across the university’s six academic divisions, the Chen Institute for Neuroscience at Caltech will catalyze a campuswide interdisciplinary community with the shared goal of understanding the fundamental principles that underlie brain function. “Everything that we are as human beings—our ability to see the world and ask questions about our universe—is rooted in the structure and function of our brains,” remarked Steve Mayo (PhD ’87), the Bren Professor of Biology and Chemistry and the William K. Bowes Jr. Leadership Chair of the Division of Biology and Biological Engineering, upon the establishment of the Tianqiao and Chrissy Chen Institute for Neuroscience. “One of the greatest challenges and opportunities of our time is to be able to unlock that structure and how it relates to function, which will have an enormous impact on the lives of real people.” Similarly, “the endowment of the Andrew and Peggy Cherng Department of Medical Engineering draws upon the expertise of faculty members across all engineering and science disciplines to bring innovative, non-invasive, and smarter medical devices to patients,” says Guruswami Ravichandran, Caltech’s Otis Booth Leadership Chair in EAS and the John E. Goode, Jr., Professor of Aerospace and Mechanical Engineering. ENGenious spoke with four Caltech faculty members to learn about the passions and forces that are enhancing their work and driving them forward. Each anticipates that the combination of an unprecedented inventory of intellectual and technological resources, the excellence of Caltech students and postdoctoral scholars, and the academic freedom afforded by the Chen and Cherng infusions will yield exponential growth for their research. There is a recognition among Caltech’s faculty that progress in human health requires scientists and engineers from a wide spectrum of disciplines to attack complex challenges and cross-pollinate ideas. The Cherng Department of Medical Engineering and the Chen Institute for Neuroscience are both dedicated to this approach. Morteza Gharib, Hans W. Liepmann Professor of Aeronautics and Bioinspired Engineering, puts it this way: “What medical and biological engineering provide are venues for researchers from biology, engineering, and information science to work on areas that can go from the lab to the bedside.” For example, Gharib’s research on the cardiovascular system is applied to new generations of heart valves and monitoring devices that unify multiple vital indices in a single blood-pressure reading in real time. When combined with the expertise of his colleagues in electrical engineering and materials science who share his interest in miniaturizing devices, there emerges the possibility of new monitoring and imaging accessories that can increase both the quality and accessibility of valuable metrics for patients and clinicians. Caltech’s creative interplay of disciplines also reflects the democratization of medicine. Caltech doesn’t have a medical school, so it forms partnerships with medical institutions in the region for access to physicians and patients. Gradinaru points to the Caltech–City of Hope collaboration, in particular: “We brought the quantitative engineering excellence of Caltech. They brought the real-world medical applications and the great physicians and scientists of City of Hope. 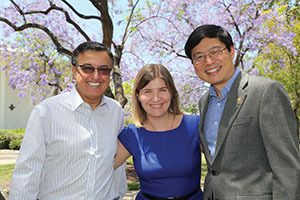 Jointly, we can better influence clinical practice for patients’ benefit.” These collaborations are part of Caltech’s overall strategy of incorporating the broadest possible range of technical approaches to improving health. “Our mission to improve human health allows for full inclusion. You might not necessarily need to change any biology to do that. Mining behavioral data and developing effective feedback systems can go a long way in guiding patient behavior to a healthier outcome,” Gradinaru explains. 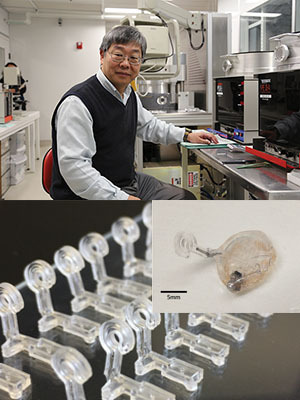 Wang sees great potential in such application of new engineering approaches in medicine. “Traditional medicine is really not that quantitative,” he says. “With technology, it is becoming more quantitative and therefore more effective. We can hasten the efficacy by injecting the lessons of physics, chemistry, biology, and quantitative science to solve medical problems more fundamentally.” In Wang’s research, this data-based approach has expanded the range of what doctors can observe happening in the body, from the smallest systems to the largest. 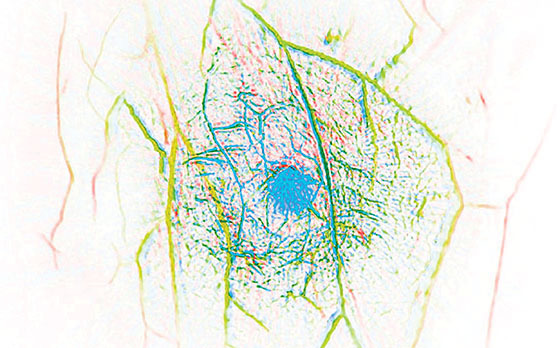 “Right now, we are the only lab in the world that provides multiscale in-vivo imaging from organelles all the way to whole-body organisms using the same contrast mechanism,” says Wang. Morteza Gharib is the Hans W. Liepmann Professor of Aeronautics and Bioinspired Engineering, Director of the Graduate Aerospace Laboratories, and Director of the Center for Autonomous Systems and Technologies. Viviana Gradinaru is Assistant Professor of Biology and Biological Engineering, a Heritage Medical Research Institute Investigator, and Director of the Center for Molecular and Cellular Neuroscience. Yu-Chong Tai is the Anna L. Rosen Professor of Electrical Engineering and Mechanical Engineering, the Andrew and Peggy Cherng Medical Engineering Leadership Chair, and the Executive Officer for Medical Engineering. Lihong Wang is the Bren Professor of Medical Engineering and Electrical Engineering. To learn more, visit mede.caltech.edu.